Front desk hours are 7 AM to 11 PM. Children 12 and younger stay free. When visiting our motel we look forward to making your visit a pleasant and memorable experience. Our commitment is to provide the comfort personalized service and convenience expected by our guests. 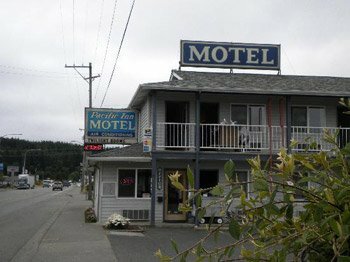 The Pacific Inn Motel is located in Forks on the Olympic Peninsula of Washington state surrounded by natures wonders. Nearby Pacific Beaches Mt. Olympus Olympic National Forest and the Hoh Rain Forest provide you recreational and scenic pleasures including Hot Springs Waterfalls and more Pacific Inn Motel is a great location to stay during Fishing and Hunting season or for Hiking and Backpacking. Forks is also the Vampire Capital of phenomenal author Stephenie Meyers TWILIGHT Saga and Pacific Inn Motel is located right in the heart of Forks near all the sites and action mentioned in the series such as Forks High School Forks Outfitters Forks Hospital La Push and many other locations. Experience many Twilight adventures while in Forks such as having your picture taken next to Bellas red truck see Dr. Cullens parking space at the Hospital Twilight memorabilia indulge in a Bella Burger Twilight Sandwich and many more. Come and celebrate the Stephenie Meyer day with us and many other Twilight fans on September 13 Bellas birthday each year. Front desk hours are 7 AM to 11 PM. Fairchild IntlHead south on Fairchild Airport Rd Fairchild Int Airport Rd toward W Edgewood Dr. Continue onto S Airport Rd. Turn right at US101 W. Destination will be on the right. Port AngelesHead southeast on E 1st St toward N Chase St. Take the 2nd right onto S Peabody St. Take the 2nd right onto E 4th St. Turn left at S Lincoln St S. Continue straight onto US101 W E Lauridsen Blvd. Continue to follow US101 W. Destination will be on the right. Clallam BayHead southwest on Frontier St toward WA112 E. Take the 1st left onto WA112 E. Continue onto WA113 S Burnt Mountain Rd. Turn right at US101 S Hwy 101 S. Destination will be on the right. Lake CrescentHead west on US101 W Olympic Hwy toward Lake Crescent Rd. Kalaloch BeachHead north on Kalaloch Campground E Rd toward Kalaloch Campground a Rd. Turn right at Kalaloch Campground a Rd. Take the 1st left to stay on Kalaloch Campground a Rd. Turn right at Kalaloch Campground F Rd. Turn left at US101 N Hwy 101 N. Destination will be on the left. Forks Timber MuseumHead northeast on S Forks Ave toward Sportsman Club Rd. Destination will be on the left. Rialto BeachHead northeast on Mora Rd toward WA110 W. Turn right at WA110 E Mora Rd. Turn left at WA110 E La Push Rd. Turn right at US101 S. Destination will be on the right. Forks Community HospitalHead northeast on Bogachiel Way toward 5th Ave. Turn right at S Forks Ave. Destination will be on the right. Neah BayHead west on Boom Rd toward Bayview Ave. Take the 1st left onto Bayview Ave. Continue onto WA112 E. Continue onto WA113 S Burnt Mountain Rd. Turn right at US101 S Hwy 101 S. Destination will be on the right. Amanda ParkHead south on Lake Dr N toward Amanda Park Rd. Take the 2nd right onto US101 N Hwy 101 N. Destination will be on the left. Hoh Rain ForestHead west on Upper Hoh Rd toward Linder Creek Ln. Turn right at US101 N Hwy 101 N. Destination will be on the left. University of Washington Research FacilityHead northeast on S Forks Ave. Destination will be on the left. LaPushHead east on WA110 E La Push Rd toward Wilson Rd. Turn right at US101 S. Destination will be on the right. Second BeachHead southeast on WA112 E Bayview Ave toward 500 Line Rd. Continue to follow WA112 E. Continue onto WA113 S Burnt Mountain Rd. Turn right at US101 S Hwy 101 S. Destination will be on the right. Sol Duc Hot SpringsHead northwest on Sol DucHot Springs Rd toward Sol DucHot Springs Rd. Turn left at Sol DucHot Springs Rd. Turn right toward Forest Service Rd 2918. Continue straight onto Forest Service Rd 2918. Turn left at US101 W Olympic Hwy. Continue to follow US101 W. Destination will be on the right.